I wrote my first crime novel at the age of nine. I say ‘novel’; it was a series of illustrated short stories in a green exercise book with Surrey County Council printed on the front, featuring a pair of child detectives called Brian and Rose, who sneaked out of their bedroom windows at night to solve crimes. These were fairly bloodless crimes – mainly jewel theft and a bit of smuggling – though Brian, who was defiantly ginger, had been known to cosh a criminal mastermind over the head to keep him quiet until the police arrived. I don’t remember much else about these stories, except that there was a Mulder-Scully kind of tension between Brian and Rose, or as much of that as you can comprehend when you’re nine. I had also absorbed from somewhere the convention of the old-style detective novels, that the official forces of the law were worse than useless, and it was up to the enterprising amateurs to outwit the villains through superior brain power. I grew up on detective stories, like most kids of my generation (pre-wizards), and when I grew out of Enid Blyton’s pink-cheeked gangs of child sleuths, I graduated to Agatha Christie, then steadily worked my way through my teens with my mother’s extensive collection of Sayers, James, Dexter and Rendell. One day, I thought, I’d write a proper murder mystery of my own. And then I fell prey to that all-too-common prejudice among literary types – that crime and thrillers were somehow inferior to ‘literature’. I wouldn’t get very far in my university interview, my teachers told me, if I talked about Inspector Morse instead of Salman Rushdie. So I did as I was told and put my crime novels and thrillers away on the shelf in favour of ‘literary’ novels, and when I left college to work in literary journalism, I allowed the same prejudice to continue. When eventually I did come to write a novel of my own, it wasn’t a detective story but something more self-consciously aimed at literary prizes. In truth, I’d been put off the idea of writing a crime novel when I realised how much research was going to be involved in a modern murder mystery. Gone were the days of the gifted amateur observing from the sidelines, peeping over newspaper or knitting to spot the clues the police had blunderingly missed. These days it was all about forensics, pathology, lab reports, procedure. If you didn’t have a solid working knowledge of the inside of a police HQ, you might as well forget it – and how did you even get to do work experience in a toxicology lab? But I never really lost the love of crime fiction, and a couple of years ago when I wanted something to read on holiday, I grabbed my battered old copy of Umberto Eco’s The Name of the Rose, which I hadn’t read for nearly fifteen years. I was reminded then how much I’d loved the combination of history and thriller, and I was struck by the idea that a historical crime novel, though it would necessarily require a good deal of research, would leave a lot more scope for a writer to fill in the blanks through imaginative invention. While I was at university I had stumbled across the figure of Giordano Bruno in a book about Renaissance occultism. Bruno immediately fascinated me; he’d been a renegade monk, excommunicated and pursued through Europe by the Inquisition for promoting Copernicus’s theory that the Earth orbited the Sun. Bruno even went further; he was one of the first to suggest that there might be many suns, each with their own planets, and that the universe might be infinite. Contemporary accounts say he was incredibly charismatic, able to talk himself out of any trouble, and he must have been, because in the space of five years he went from fugitive heretic in Italy to personal philosopher to the King of France. I remembered Bruno when I started thinking about writing a historical thriller, and how I had thought when I first read about him what a great character he would make for a novel. So I read up on him a bit more, and found a book by Professor John Bossy that attempted to prove Bruno had worked as a spy for Elizabeth I’s government during the three years he lived in England. That was my Eureka moment; I didn’t care whether Bossy’s theory was true or not, if the possibility was there, so was a story. Elizabethan England was a setting rich with intrigue: Catholic Europe was desperate to bring the heretic island back under the control of the Pope, and seminaries in France and the Low Countries were training up scores of young Catholic priests for martyrdom missions inEngland, with uncanny parallels to modern religious conflict. Elizabeth’s Secretary of State, Sir Francis Walsingham, is often called the father of modern espionage; he formed a centralised intelligence network, funding informers all over the country and abroad to grass up Catholic conspirators. That was the background; the story came from Bruno himself. In 1583 he was invited to OxfordUniversity to take part in a public debate about Copernicus (the weight of public opinion was firmly with his opponent). Bruno hated Oxford, and always wrote about it with bitterness. I decided to create the story that would explain why he had had such a bad time there. An Oxfordcollege also handily provided the closed community setting familiar to classic detective fiction – I figured I’d do better to start out with a tried and tested template. 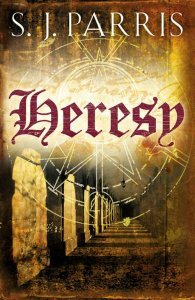 The result is Heresy, by S.J. Parris – the pseudonym is there (Ed's note: her "real" name is Stephanie Merritt), not for any sinister purpose but to make clear that these novels are something different from my journalism or other books I’ve written. It’s a novel I’ve had enormous fun researching and writing; I hope it gives readers as much pleasure as I’ve had reconnecting with the world of crime fiction.